New signing James Tarkowski is expected to come into contention for the trip to Reading on Saturday. The £3m centre back, who arrived on a three-and-a-half-year deal from Brentford on deadline day, was left out of the 18-man squad for the 1-0 win at home to Championship leaders Hull City on Saturday, as Burnley moved to within a point of the Tigers and Middlesbrough in second. Tarkowski hadn’t played for the Bees since the 1-0 defeat to Boro on January 12th, having told boss Dean Smith he didn’t want to play against the Clarets later that week. Dyche explained: “I told him, I said ‘you’ve had a lot go on’, he’s missed a bit of training. “It’s different how we work to where he’s been at Brentford, so I wanted to do some work with him first and allow him to ease his way into the group. 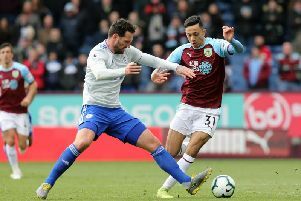 Tarkowski faces a tough task to break into the side at present, with Burnley unbeaten in the league since Boxing Day, since Ben Mee and Michael Keane have been paired together at centre back. “Joey (Barton) has been very good, he’s enjoying his football, but he’s in a team of very good people, not just players. “Leadership is shown in many different ways, Ben Mee shows it in the way he’s going about it, Michael Keane is growing into leadership, (Sam) Vokesy shows it win his ability to play as a team player, Andre (Gray) shows it with his goals. Vokes netted his eighth goal of the season to see off the Tigers, his fourth in six games, and Dyche is delighted with the Wales striker, who last month committed his future to the club to the summer of 2019: “I’ve said all season, Vokesy goes under the radar sometimes, that’s why we got him on a new contract, because we see what he is as a person and a player. “He’s been delivering good performances all season and he wants goals, but he’s happy when the team is winning and he’s making goals as well.